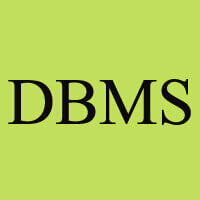 DBMS Tutorial provides basic and advanced concepts of Database. Our DBMS Tutorial is designed for beginners and professionals both. Database management system is software that is used to manage the database. Our DBMS Tutorial includes all topics of DBMS such as introduction, ER model, keys, relational model, join operation, SQL, functional dependency, transaction, concurrency control, etc. The database is a collection of inter-related data which is used to retrieve, insert and delete the data efficiently. It is also used to organize the data in the form of a table, schema, views, and reports, etc. For example: The college Database organizes the data about the admin, staff, students and faculty etc. Using the database, you can easily retrieve, insert, and delete the information. Database management system is a software which is used to manage the database. For example: MySQL, Oracle, etc are a very popular commercial database which is used in different applications. DBMS provides an interface to perform various operations like database creation, storing data in it, updating data, creating a table in the database and a lot more. It provides protection and security to the database. In the case of multiple users, it also maintains data consistency. Data Definition: It is used for creation, modification, and removal of definition that defines the organization of data in the database. Data Updation: It is used for the insertion, modification, and deletion of the actual data in the database. Data Retrieval: It is used to retrieve the data from the database which can be used by applications for various purposes. User Administration: It is used for registering and monitoring users, maintain data integrity, enforcing data security, dealing with concurrency control, monitoring performance and recovering information corrupted by unexpected failure. It uses a digital repository established on a server to store and manage the information. It can provide a clear and logical view of the process that manipulates data. DBMS contains automatic backup and recovery procedures. It contains ACID properties which maintain data in a healthy state in case of failure. It can reduce the complex relationship between data. It is used to support manipulation and processing of data. It is used to provide security of data. It can view the database from different viewpoints according to the requirements of the user. Controls database redundancy: It can control data redundancy because it stores all the data in one single database file and that recorded data is placed in the database. Data sharing: In DBMS, the authorized users of an organization can share the data among multiple users. Easily Maintenance: It can be easily maintainable due to the centralized nature of the database system. Reduce time: It reduces development time and maintenance need. Backup: It provides backup and recovery subsystems which create automatic backup of data from hardware and software failures and restores the data if required. Cost of Hardware and Software: It requires a high speed of data processor and large memory size to run DBMS software. Size: It occupies a large space of disks and large memory to run them efficiently. Complexity: Database system creates additional complexity and requirements. Higher impact of failure: Failure is highly impacted the database because in most of the organization, all the data stored in a single database and if the database is damaged due to electric failure or database corruption then the data may be lost forever. Before learning DBMS Tutorial, you must have the basic knowledge of Basic Database. Our DBMS Tutorial is designed to help beginners and professionals. We assure that you will not find any problem with this DBMS Tutorial. But if there is any mistake, please post the problem in the contact form.